by Chris Woodford. Last updated: February 26, 2019. The worst thing that could ever happen to you on a ship in the middle of the ocean would be for water to flood in and make you sink. But if you're on-board a submarine, sinking is exactly what you want! Unlike ships, which pitch and roll as they struggle across the waves, submarines slip swiftly and silently through the calmer waters beneath. They are lean, mean, military machines and they can stay submerged for weeks or even months at a time. Let's take a closer look at how they work! Photo: The fast-attack, nuclear-powered submarine USS Dallas (SSN 700) heads out to sea. Photo by Paul Farley courtesy of US Navy. Photo: Submarine ahoy! When we see photos of submarines floating on the surface, it's hard to imagine how big they really are: like icebergs, virtually all of a floating sub is underwater. In this very unusual picture of a submarine in dry dock for maintenance, you can clearly see how big a submarine really is—and that it really is almost a perfect cylinder. Photo of USS City of Corpus Christi at Pearl Harbor Naval Shipyard by Dustan Longhini courtesy of US Navy. Oceans are most turbulent where wind meets water: on their surface. The waves that race across the sea are a sign of energy, originally transmitted by the Sun and whipped up into winds, racing from one side of the planet to the other. Ships battle and lurch across tough seas where no fish—worth its salt—would ever swim. Sailing ships make good use of winds, harnessing the gusts of air to make a very effective form of propulsion. Diesel-powered ships stay on the surface for a different reason: their engines need a steady supply of oxygen to burn fuel. In theory, it should be much easier for ships to swim under the waves where the water is calmer and puts up less resistance; in practice, that creates a different set of problems. If you've ever gone snorkeling or scuba diving, you'll know that life underwater is very different from life on the surface. It's dark and difficult to see, there's no air to breathe, and intense water pressure makes everything feel uncomfortable and claustrophobic. Submarines are ingenious bits of engineering designed to carry people safely through this very harsh environment. Although they were originally invented as military machines, and most large subs are still built for the world's navies, a few smaller subs do work as scientific research vessels. Most of these are submersibles (generally small, unpowered, one- or two-person submarines tethered to scientific research ships as they operate). Photo: Despite many technological advances, the basic concept of the submarine has changed little in over a century, since John Holland designed the USS Holland, the US Navy's first submarine. Photo by courtesy of Naval Historical Center. These are some of the key parts of a typical submarine. The pressure of water pushing inward is the biggest problem for anyone who wants to go deep beneath the ocean surface. Even with scuba tanks, we can dive only so far because the immense pressure soon makes it impossible to breath. At a depth of 600m (2000ft), the maximum depth subs ever dive to, the water pressure is over 60 times greater than it is at the surface! How do subs survive where people can't? The hull of a standard ship is the metal outside that keeps the water out. Most submarines have two hulls, one inside the other, to help them survive. The outer hull is waterproof, while the inner one (called the pressure hull) is much stronger and resistant to immense water pressure. 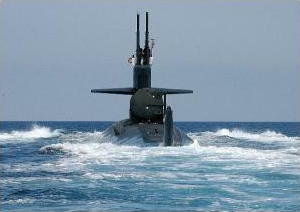 The strongest submarines have hulls made from tough steel or titanium. Photo: The diving planes on either side of a submarine's tower generate lift as it moves forward, just like the wings on a plane. Photo of USS Emory S. Land by Jared Aldape courtesy of US Navy. Just as sharks have fins on their bodies to help them swim and dive, so submarines have fins called diving planes or hydroplanes. They work a bit like the wings and control surfaces (swiveling flaps) on an airplane, creating an upward force called lift. Buoyancy is the tendency of something to sink, rise, or float at a certain depth. While it's underwater, a submarine is negatively buoyant, which means it tends to sink, left to its own devices, if it's not moving. But as the submarine's propellers push it forward, water rushes over the planes, creating an upward force called lift that helps it remain at a certain depth, creating a state of neutral buoyancy (floating). 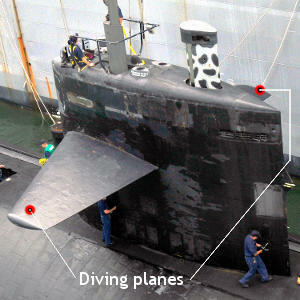 The planes can be tilted to change the lift force, so making the submarine climb or dive through the sea, as necessary. The planes provide most of the submarine's control of its depth, most of the time. The amount of lift they generate depends both on the angle to which they're tilted and on the submarine's speed (just as the lift that wings generate depends on a plane's speed and "angle of attack"). There are spaces in between the two hulls that can be filled with either air or water. These are called the ballast tanks and, with the diving planes, they give a sub control over its buoyancy, particularly during the first part of a dive or a return to the surface from the depths. When the ballast tanks are filled with air, the submarine rises to the surface because it has positive buoyancy. With water inside the tanks, the sub has negative buoyancy so it sinks deeper into the ocean. The tanks at the front (known as the front trim tanks) are usually filled with water or air first, so the submarine's front (bow) falls or rises before its rear (stern). The ballast tanks can also be used to help a submarine surface very quickly in an emergency. Gasoline engines and diesel engines used by cars and trucks, and jet engines used by planes, need a supply of oxygen from the air to make them work. Things are different for submarines, which operate underwater where there is no air. Most submarines except nuclear ones have diesel-electric engines. The diesel engine operates normally when the sub is near the surface but it doesn't drive the sub's propellers directly. Instead, it powers an electricity generator that charges up huge batteries. These drive an electric motor that, in turn, powers the propellers. Once the diesel engine has fully charged the batteries, the sub can switch off its engine and go underwater, where it relies entirely on battery power. Early military submarines used breathing tubes called snorkels to feed air to their engines from the air above the sea, but that meant they had to operate very near the surface where they were vulnerable to attack from airplanes. 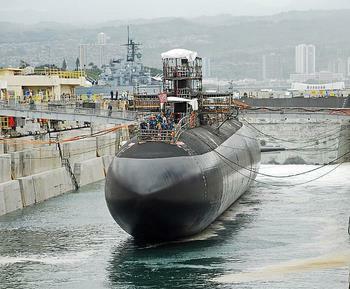 Most large military submarines are now nuclear-powered. Like nuclear power plants, they have small nuclear reactors and, since they need no air to operate, they can generate power to drive the electric motors and propellers whether they are on the surface or deep underwater. Photo: The tower or sail can double up as an observation platform when the sub is cruising on the surface. Note the various different communications and navigation antenna. Photo by Jeffrey M. Richardson courtesy of US Navy. Submarines are cigar-shaped so they can slip smoothly through the water, but in the very center there's a tall tower. In older submarines, the tower was packed with navigation and other equipment and was sometimes known as the conning tower (because, historically, it contained a submarines controls). It's also referred to simply as the tower or the sail, because in a modern submarine the controls and navigation equipment take up more room and tend to be located in the hull. Photo: Periscopes are useful if you're near the surface searching for enemy ships but they're useless underwater. 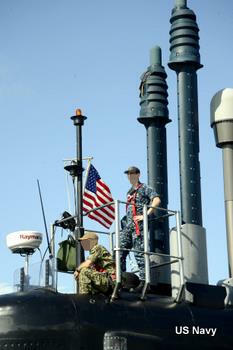 Photo by Jeffery S. Viano courtesy of US Navy. Light doesn't travel well through water, so it gets darker and darker the deeper down you go. Most of the time, submarine pilots can't even see where they're going! Submarines have periscopes (seeing tubes that can be pushed up through the tower), but they're useful only when subs are on the surface or just beneath it. 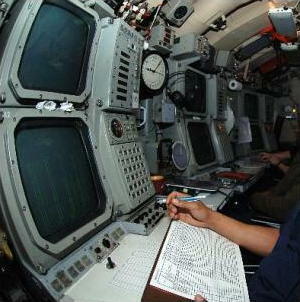 Submarines navigate using a whole range of electronic equipment. There's GPS satellite navigation, for starters, which uses space satellites to tell the submarine its position. There's also SONAR, a system similar to radar, which sends out pulses of sound into the sea and listens for echoes reflecting off the seabed or other nearby submarines. Another important navigation system onboard a submarine is known as inertial guidance. It's a way of using gyroscopes to keep track of how far the submarine has traveled, and in which direction, without referring to any outside information. Inertial guidance is accurate only for so long (10 days or so) and occasionally needs to be corrected using GPS, radar, or other data. 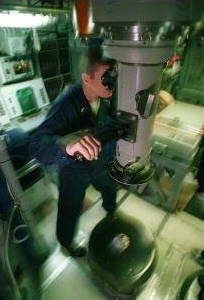 Photo: The sonar apparatus in a typical submarine. Photo by Brandon Shelander courtesy of US Navy. A large military submarine has dozens of people onboard. How can they eat, sleep, and breathe, buried deep beneath the sea, in freezing cold water, for months at a time? A submarine is a completely sealed environment. The nuclear engine provides warmth and generates electricity—and the electricity powers all the life-support systems that submariners need. It makes oxygen for people to breathe using electrolysis to chemically separate molecules of water (turning H2O into H2 and O2) and it scrubs unwanted carbon dioxide from the air. Subs can even make their own drinking water from seawater using electricity to remove the salt. Trash is compacted into steel cans, which are ejected from an airlock system (a watertight exit in the hull) and dumped on the seabed. 1620: Englishman Cornelis Drebble (1572–1633) builds the first submarine by waterproofing a wooden, egg-shaped boat with leather and coating the whole thing in wax. Scientists are uncertain whether Drebble's boat ever set sail. 1776: During the US revolution, David Bushnell (1742–1824) builds a hand-powered one-person submarine called the Turtle to help attack British warships. 1800: American steam engineer Robert Fulton (1765–1815) designs a convertible ship with folding-down sails that can turn itself into a submarine for traveling underwater. 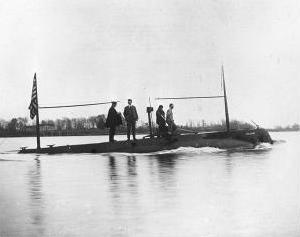 1897: American inventor Simon Lake (1866–1945) launches the Argonaut, the first submarine to operate in the open sea. Photo: The USS Holland (Submarine Torpedo Boat # 1) underway, circa 1900. Photo by courtesy of Naval Historical Center. 1900: The US Navy launches its first ever submarine, the USS Holland, named for its Irish-American inventor John Holland (1840–1914). Although Holland had offered submarines to the Navy for years beforehand, it had originally shown no interest. 1908: Russia's Pochtovy is an early pioneer of Air Independent Propulsion (AIP)—operating a submarine without frequent trips to the surface—using a gasoline engine fed by compressed air. 1914–18: During World War I, the German navy operates a fleet of highly effective military submarines called U-boats (short for Unterseeboot, which means underwater ship). In the 1930s, the Germans start using snorkel tubes (invented by a Dutch engineer) to supply air to their U-boat's diesel-electric engines, giving them greater range and effectiveness. 1930s: Germany engineer Hellmuth Walter pioneers high-thrust hydrogen peroxide engines for use in submarines and missile rockets. It's another step forward for Air Independent Propulsion. 1952: French underwater photographer Dimitri Rebikoff launches the Poodle, the first tethered Remotely Operated Vehicle (ROV). 1955: The US Navy launches the USS Nautilus, the first nuclear-powered submarine. 1964: Alvin, a scientific research submersible operated by Woods Hole Oceanographic Institution, begins its long and distinguished history of underwater exploration. Its major successes including discovering black smokers (hydrothermal vents—a bit like chimneys in the ocean floor) and exploring the wreck of the Titanic. 1968: The Soviet Union (Russia and its former allies) launches K-162, the first submarine with a titanium hull and the world's fastest. 1969: The Soviets launch the first of their sleek, fast, titanium-hulled Alfa-class nuclear submarines. Photo: What of the future? Over two thirds of our planet is water, so submarines will always have a place in the military. But when it comes to scientific exploration, small robotic submersibles, like this Super Scorpio remotely operated vehicle (ROV), are becoming increasingly important. Note the video cameras on the front and the large, silver, robotic grabber arms. Photo by Geoffrey Patrick courtesy of US Navy. 1990s: Nuclear submarines made redundant by the end of the Cold War are used for oceanographic and climate research in the Arctic in a project named Science Ice Exchange (SCICEX). 1990s: British-born submarine designer Graham Hawkes promises to revolutionize sub design with small, plane-like submersibles called Deep Flight that "fly" underwater. 1990s–: As in many other industries, China emerges as a major supplier of affordable but effective diesel-electric military submarines, including refurbished versions of the old 1960s–1980s Ming class (Type 035) and the more recent Song class (Type 039). The Illustrated World Guide to Submarines by John Parker. Anness Publishing, 2013. A detailed photographic guide to 140 of the world's more notable submarines. Submarines: An Illustrated History of their Impact by Paul E. Fontenoy. ABC-CLIO, 2007. A chronological account of submarine technology. The Submarine Book by Chuck Lawliss. Burfood Books, 2000. Another historic account of the development of submarines, from the Drebble to the nuclear sub. Ships and Submarines by Chris Woodford. Facts on File, 2004. My own short (96-page) introduction covers the history of shipping in chronological order. For ages 9–12. Submarines by Rebecca Stefoff. Marshall Cavendish, 2006. A shorter introduction aimed at ages 9–12 (but suitable for older readers too). Houston Mechatronics Raises $20M to Bring NASA Expertise to Transforming Robot Submersibles by Evan Ackerman. IEEE Spectrum, April 26, 2018. 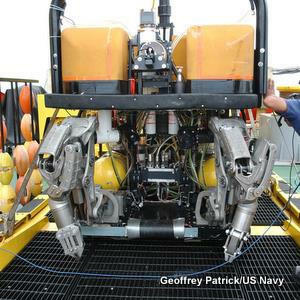 What happens when you cross a robot with a submersible? World's Largest Swarm of Miniature Robot Submarines by Evan Ackerman. IEEE Spectrum, May 5, 2015. How swarms of autonomous underwater vehicles (AUVs) could cooperate to achieve complex missions. Russia Launches Quietest Submarine in the World by Zachary Keck. The National Interest, April 29, 2015. All about the new diesel-electric Krasnodar, a type of Kilo-class submarine so quiet it has earned the nickname "black hole." How we can get submarines to travel at supersonic speed by Jordan Golson. Wired, 25 August 2014. Chinese researchers are developing subs that can travel faster than most jet places, using a technology called supercavitation. Q&A With Graham Hawkes, the Man Who Built the Deep Flight Challenger Submersible: Popular Mechanics, 8 April 2011. Graham Hawkes explains the concept of Deep Flight subs that fly underwater like planes. New UK nuclear submarine launched: BBC News, 8 June 2007. A guide to Britain's state-of-the-art submarine, HMS Astute. The First Soviet Giants by Norman Polmar, Undersea Warface (The Official Magazine of the US Submarine Force), Fall 2001. An intriguing article about the development of giant Soviet cargo submarines after World War II. Unravelling a Cold War Mystery: CIA Library, 1993. A fascinating declassified article explaining how the CIA tried to figure out the latest advances in Soviet submarine design during the Cold War.